Welcome and God bless you. I've been putting this information together for a long time. As I grow older, my ability to keep up with this site is getting more difficult but I'm doing my best. The other day a friend called me "Old man Phoenix" and I rather like the title. Be welcome here, and I hope you learn what you came here to learn. Powwow requires very few tools or props. 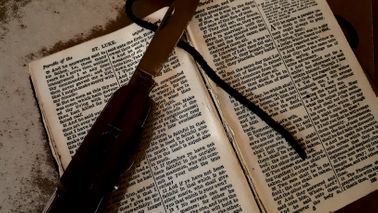 A bible, a trusty pocket knife, maybe some string and a few stones, and you have all you need to heal and break hexes. When we ripped down our old garage last year and built a new one, the workers unearthed a section of tombstone. Our property was once a part of a military fort. I make it a point to honor the spirits of the dead when I am powwowing. I've even asked for their assistance on occasion. My Sanctum Sanctorum. I spend a lot of my alone time in my home library. I'm surrounded by my books and I can pray and think and reflect and meditate. This sign hangs on our front porch. 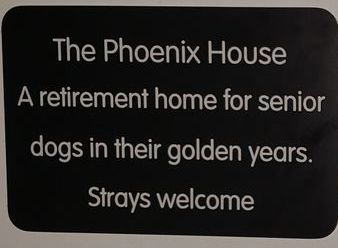 We have opened our home to dogs that have been abandoned due to age. We currently have five dogs that are in their golden years. We give them a comfy home to live in, tons of love, and whatever else they need and want to make their lives happy until the very end. We do this out of our own hearts and pockets because Bill and I, as well as our son, believe that everyone (human and animal) deserves to live out their lives in comfort, dignity, and surrounded by love and care. The picture above is my first sign advertising my powwowing services, way back around 2005-2006 (before I got married and changed my last name). The flyer above is from a workshop I did way back in 2010. Dowsing for water is an old skill but can still have its uses today. 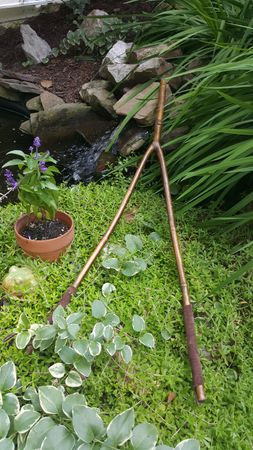 I was taught how to dowse by a gentleman from Northumberland County earlier this year after talking with him at the Legends and Lore event at the PA State Museum in Harrisburg. There's a little more to it than I thought there would be, but learning it was an enjoyable experience and I've incorporated it into my powwowing. My loyal best friend, Arthur. Happy Summer!!! I know it's not technically "summer" in south-central Pennsylvania but for me it basically is! The flowers are growing, the grass is green and thick, the trees are full and lush, it's a beautiful time of year! My email inbox is getting filled up lately with requests for teaching and hex-removal. Both are odd requests for me because I do not consider myself to be a great teacher, nor do I understand where all these hexes are coming from! Our country is in an odd state these past few years, so I definitely understand the feeling of negative vibes. If you feel you have been verhexed, perhaps it is just the negative energies that our country is experiencing right now??? lf you truly believe you have been ferhexed then contact me. Life has been strange lately. I've been busy, that's for sure! I have a husband, a son, a home and property, a career, and I'm taking college courses. 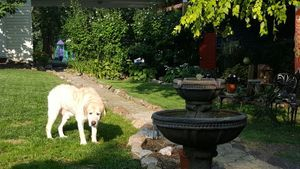 In addition, we have a senior dog rescue and our own life issues to care for. All of this takes up our time!!! But I've still been receiving requests for Powwow, which is just fine, as I will always make time for these! Here in Pennsylvania, we have our very own folk magic tradition solidified by our cultural ancestors almost 300 years ago. Today, Powwowing still thrives amongst the Pennsylvania German culture. I am just one voice amongst many. I am certainly not the foremost authority on Powwowing, nor am I alone in my efforts to share information and preserve this amazing piece of our culture. Powwow is definitely a passion of mine. I've spent years and years researching and learning about all sorts of folk magic traditions and religious practices. But nothing has captured my heart like Powwowing. This website is a way for me to share this passion with whoever wants to learn about it. My family immigrated to Pennsylvania in the 1800's from Austria. They laid down their roots in Schuylkill and Berks Counties. I have extensive family records and know where all of my ancestors lived, went to church, and where they are buried. I hope that the work I do with powwowing makes them proud of me. I have a great family and career and am very much connected to our property and our state of Pennsylvania. I believe strongly in the power of God, I believe very much in the power of powwow, I love sitting on the porch or patio and reading a good book, I think the greatest song ever is Tina Turner's "Better Be Good to Me", and I've never met a vodka that I didn't like. I drive an old BMW that has seen better days and I'm usually never seen without my 7 year old son. The three most important things in my life are my family, my health, and my spirituality. Powwowing is an extension of my spirituality and so you can be sure I'm doing my best to represent the tradition. 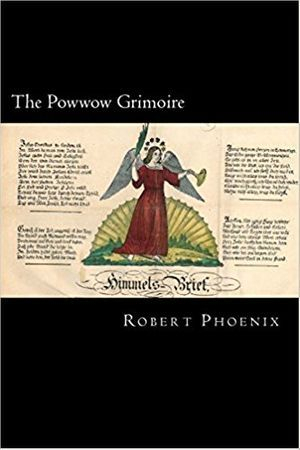 My book, The Powwow Grimoire, is available on amazon.com or any online book retailer. 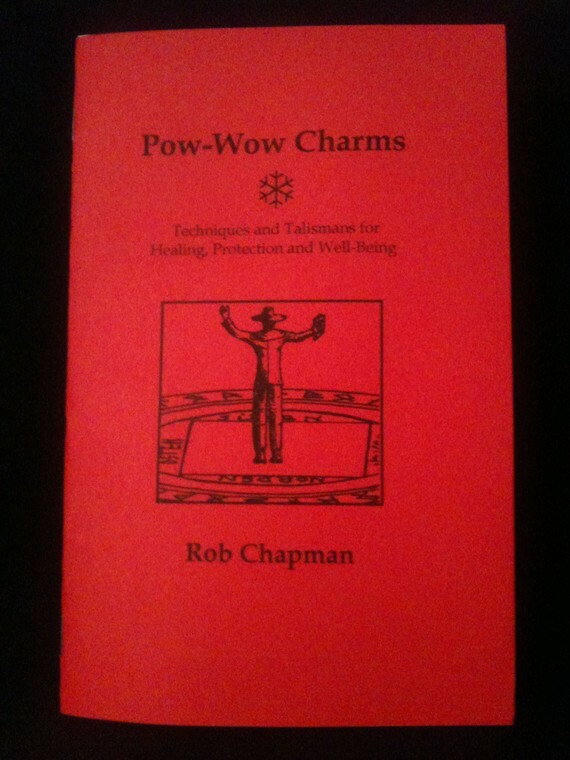 This book is designed for those who want to start working Powwow techniques. Click on the picture to purchase. Thank you! "Essentially, powwow doctors ministered to the sick using practices that were borrowed from liturgical tradition. It should therefore be no surprise that some pastors participated in the tradition and that any form of sanctioning from the clergy would be valued by the laity. In fact, the names and reputations of ministers are generously interwoven through powwow narratives, with representatives in many denominations." What can you do for me? I'm a powwow. That means I believe in the Holy Trinity of God the Father, God the Son, and God the Holy Spirit. While I have studied and learned many things over the years, including new age paganism and witchery, I have returned to my family roots as a Christian and have incorporated all of my skills into my practice of powwowing. If you come to me, it is with the understanding that I am a Christian and I will be trying for you using the historical, cultural, and religious practice of powwow. However, I absolutely recognize and appreciate that there are MANY views of divinity in the world and I am open-minded about all of them, even if I don't personally carry those beliefs. I can try for you if you need healing. 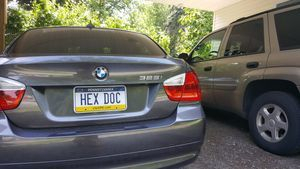 I can work for you if you need hex removal. I can create protective talismans and himmelsbriefs if that is what you need. I can also throw a hex if necessary, but that will be up to me if the situation warrants it. I do not charge money for what I do because the power is God's, not my own. I will take your situation into consideration and let you know what I believe the best course of action is. Most often I will give you suggestions about what you can do for yourself while I do some stuff on my end. Powwow is a tradition of spells and charms that are empowered by belief in the Holy Bible, which are designed to heal and protect and combat witchcraft. Powwow is both simple and complex. 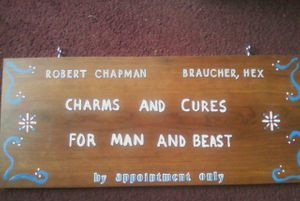 The charms and cures appear, on the surface, to be simply spoken words and gestures. But a more thorough examination reveals that they are ritualistic and powered by astrological energies in addition to the inherent healing power of Christ. Don Yoder, considered by many to be THE expert on powwowing, describes powwow as "Pennsylvania's native brand of religious healing, on the folk-cultural level, using words, charms, amulets, and physical manifestations in an attempt to heal the ills of man and beast." Powwowing is the folk magic system as practiced by the Pennsylvania German culture for the past three hundred years, give or take, here in rural Pennsylvania. It is a blend of many systems, such as folk Christianity and eastern European superstition; ceremonial magic, Cabbalistic influence, and Judeo-Christian folklore. 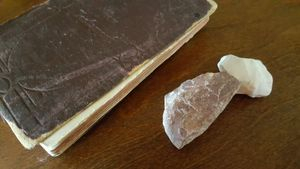 "In later years a book of "pow wows" confirming authority given by Jesus to the Elders of the Church, and evidencing some use and nurture among their forbears, was to become a household book, at least with others of German extraction. Known as a "ga-brauch buch," it had a wide circulation, and is still in demand by the descendants of orthodox families and many non-Amish who have heard of its virtue." 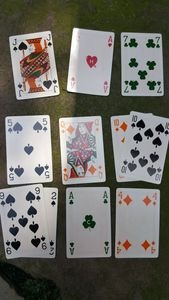 One was white, another black and the third was red. Stroke the person (or animal) you would benefit. At each repetition strike him on the back; the first time, once; the second time, twice; the third time, thrice; and set a time for the worms, but not less than three minutes. Much of what we know as Powwow comes from writings such as Albertus Magnus Egyptian Secrets and John George Hohman's Long Lost Friend and also the Romanusbuchlein. 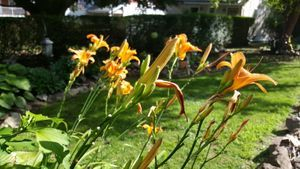 It is a relatively simple folk magic practice used for healing common ailments, protection against certain conditions, and other daily household cures and charms. Powwowing originated with European magical practices and was brought here to Pennsylvania by the German-speaking immigrants who became known as the "Pennsylvania Dutch". The history of the German and Swiss immigration to Pennsylvania was all about religious freedom and economic opportunity. In the German provinces, as well as Austria and Russia and other European locations, the people were not given a choice in their religious practice. Anyone not in line with the beliefs of the royalty were considered heretics and were often hunted down, arrested, put on trial, or worse... Once the Reformation began, religious tensions ran high, and persecution became commonplace. The Anabaptists knew persecution better than anyone. Their beliefs in adult baptism (that conversion should be a choice) were considered heretical, and their people were hunted down and, in many instances, beheaded. For a more in-depth look at the many Anabaptists who died for their faith, read The Martyrs Mirror. The promise of religious freedom in the New World by William Penn, who was himself quite familiar with religious persecution, was appealing to them, and the waves of immigration began. Early Pennsylvania was both a time of hardship as the people established homes and lands for themselves, but also an exciting time where the Anabaptists, the Quakers, the Brethren, the Moravians, the Lutherans, the Reformed (and a host of other smaller Christian sects) found freedom of religious expression. The fact that our ancestors could choose which church to attend was a very big deal for them, and is part of what makes Pennsylvania such a culturally-diverse state. Mer sott em sei Eegne net verlosse; Gott verlosst die Seine nicht. "One should not abandon ones own; God does not abandon his own." In 1683 the Plain Sects began to arrive in William Penn's Colony seeking a land of peace and plenty. They were a mixed people; Moravians from Bohemia and Moravia, Mennonites from Switzerland and Holland, the Amish, the Dunkards, the Schwenkfelds, and the French Hugeunots. After the lean years of clearing the land and developing their farms they established the peace and plenty they sought. These German-speaking people were originally called the Pennsylvania Deutsch but time and custom have caused them to be known to us as the Pennsylvania Dutch. When we think of the "Pennsylvania Dutch" ( or Deitsch, or, more properly, German), we tend to think primarily of the Mennonites and the Amish. But these groups make up only a small fraction of the Pennsylvania German culture. The fact is, the majority of what remains of the Pennsylvania German culture here in our home state of Pennsylvania are 'regular folks' just like everyone else. Many of us no longer live on farms or in the early settlement areas once inhabited primarily by the Germanic/Swiss immigrants. However, our way of life is still our own, and we fiercely cling to those bits of our ancestor's culture that define us as one of the most influential cultures in American history. Folk magic and faith healing are very much ingrained in the Pennsylvania German culture. And the Mennonites and Amish were not immune to this either, despite their strict religious views. In fact, powwowing and the Christian faith go hand-in-hand, and often the lines between biblical admonition against folk magic and powwowing are quite blurry. "Sympathy curing, also called powwowing, plays a minor role in Amish healing even though some Amish condemn the practice. Powwowing is defined as a native brand of faith healing - using words, charms, amulets, and physical manipulations in an attempt to heal man or beast. Other terms used for powwowing are "charming", "conjuring", "to try for", and "to use" (a direct translation from the German term Brauche). Powwowing apparently has no direct connection to Indian folk medicine, but was transplanted to America by immigrants from the Rhineland and Switzerland. The practice is not unique to the Amish, for at one time it was a common healing art among Pennsylvania Germans." According to Don Yoder, foremost expert on the history of Powwowing, "Central to this form of religious healing is faith in God, faith in the powwow doctor, and the patient's faith in himself....Though powwow doctors will work on any kind of animal, adult patients must have been baptized as Christians. Exceptions are made for children not yet baptized." The full article, appearing on philly.com 1997, can be read HERE. To study powwowing, one must really immerse themselves into the study of the Pennsylvania German culture, alongside the history of our religious development both in our ancestral countries of Switzerland, the Rhineland, Austria, and so forth, and here in Pennsylvania. The development of the two are very much intertwined. To follow the practice of powwowing throughout history is to follow the progress of our culture; from the earliest waves of immigration into the modern day. Sadly, the fading of powwowing from popular view is also a testament to the thinning out of Pennsylvania German culture, and a sad view of the loss of our cohesion. My fear is that someday our culture will be a thing of the past, and that is why I work so hard to preserve this information. Powwowing, while well-known and practiced within Pennsylvania German society, was not always understood or accepted by those outside of our culture. The faith healing practices and home remedies were often a part of the reason that our ancestors were referred to as the "dumb dutch". But within our community, the practice flourished and was quite successful. We see more evidence of powwowing from the early 1800's forward, after the largest groups of immigrants came to this country. Prior to that it is more difficult to find evidence; at least here in America. 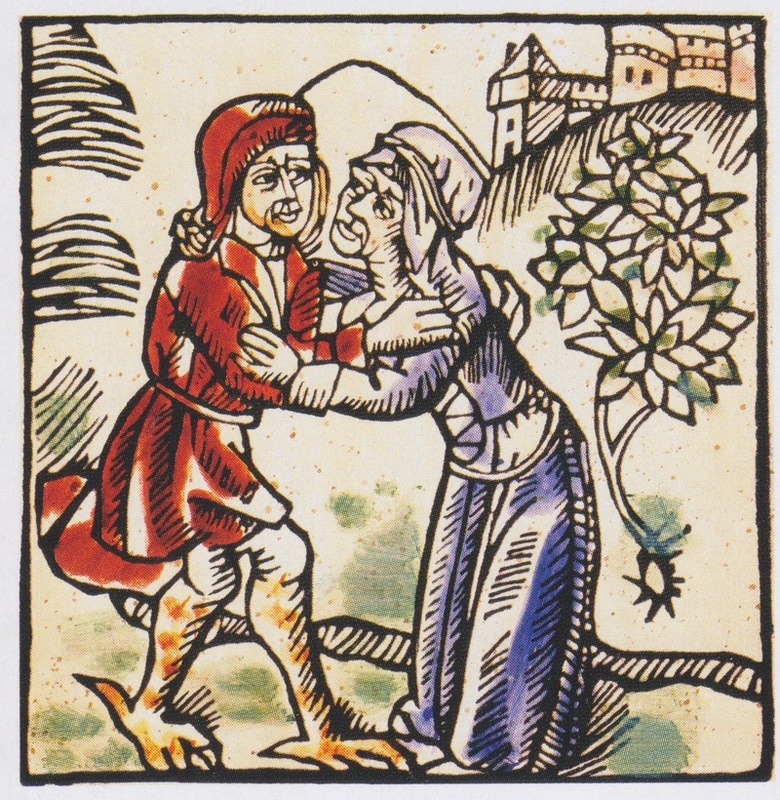 "An Anabaptist healer, it is recorded, cured sprained ankles in the following manner. "Between eleven and twelve o'clock at night he came to the patient's bed, opened a book of spells from which he read a few cabalistic formulas, while touching the injured foot from time to time with the tip of his outstretched hand, as to form a cross". Following this the healer continued reading beside the fireplace in a grave, deep-set voice for half an hour. 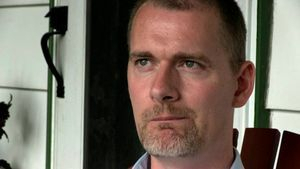 The healing was not to take place until a second set of operations was concluded." 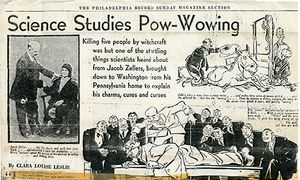 The medical profession had an intense dislike for the practices of powwowing and, as was standard at the time, they often did intensive studies of our cultural healing methods and wrote lengthy papers on them; most often in an attempt to paint the Pennsylvania German culture as superstitious and uneducated. One such example is Folk-Medicine of the Pennsylvania Germans, a lecture presented in May 1889 by W.J. Hoffman, M.D. 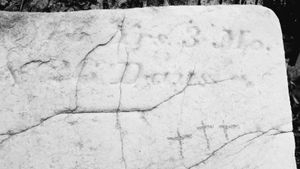 While works like these are important because they help preserve aspects of Pennsylvania German folk healing that might otherwise not have been written down, the tone in which many of these professionals presented their findings is rather biased. You can read the entire text HERE. In the early 1900's, it was common for scholars and other writers to label powwow doctors as "witch doctors". In most instances, this is a harmless usage of the term, although it can be misleading. In other cases, it's almost meant as a derogatory statement against a system of magic that the author does not personally believe in. Here is quote from the German Folklore Society, 1904, as a preface to a translation of The Long Hidden Friend, the precursor to The Long Lost Friend, by John George Hohman. "This curious book was written in I8I9 by John George Hoh-man, and for almost a century has been held as a prime authority by the witch-doctors of this section. These witch-doctors are generally known as "hex-doctors " (German "hexe," a witch), and the practice of their arts is often called "pow-wowing." It must not be understood from these terms, however, that the witch-doctor is in league with the powers of darkness. 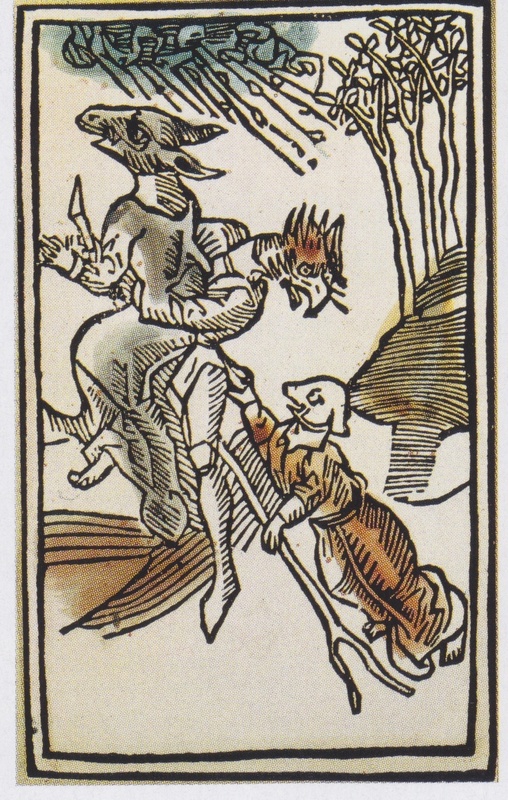 On the contrary, he makes it his business to overcome by pious charms the malign influences of the witches who have placed their spells upon man or beast. Accordingly, the incantations of the witch-doctors make extensive use of religious symbols and prayers in which one easily recognizes the survivals of liturgical weapons employed by the mediaeval church in its warfare against witchcraft." 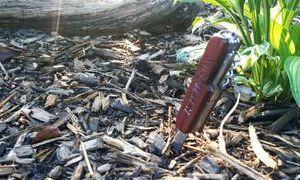 A Morning Prayer on Land for Protection from Misfortune. I (here pronounce your name) to-day purpose to go out. I will go God's path and way, where God and the Lord Jesus Christ have gone, and the Madonna and child, with her seven rings, with her true things. Oh, my dear Lord, I am thine own; let no dog bite me, no wolf bite me, no murderer kill me, protect me, oh God, this day. I stand in God's hand; there I bind myself; in God's hand am I bound by the sacred fire wound of our Lord God, that no weapon may injure me. Say three Pater Nosters, three Ave Marias, and the creed. If you'd like to read The Long Hidden Friend, I recommend THIS LINK to The Journal of American Folklore. The book can be opened as a pdf document. Original pencil drawing of John Blymire working a charm over a rabid dog. This incident is recorded in local folklore as taking place in or around the year 1928. John Blymire was a powwow from a long line of powwowers (his father, his grandfather, etc.). In November 1928, John believed he had been hexed by another powwower, Nelson Rehmeyer, and he eventually (with the help of two accomplices) murdered Mr. Rehmeyer. 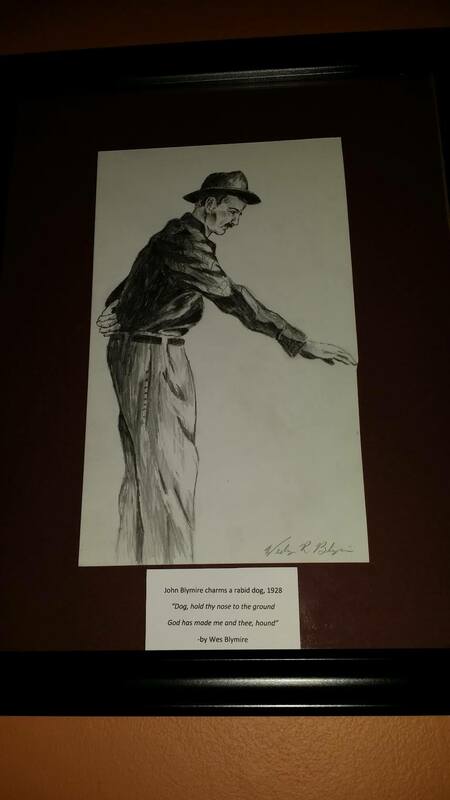 This drawing was done by Wesley Blymire, John's living descendant, and it now hangs framed in my home. Where is Pennsylvania Dutch country? 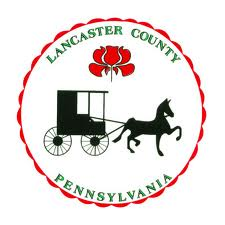 If you travel to Pennsylvania, it is well worth a trip into Berks, Dauphin, Cumberland, Lancaster and York counties to see some of the finest examples of Pennsylvania Dutch living! 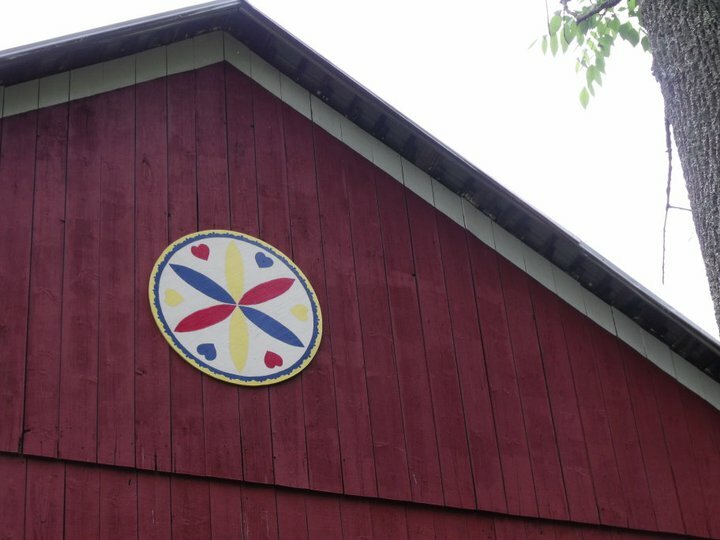 Barns decorated with hex signs still dot the countryside; farmer's markets and PA Dutch shops are peppered throughout the counties. The Amish and Mennonite communities are prevalent throughout the region. Home cooking is never so good as it is in PA Dutch country. 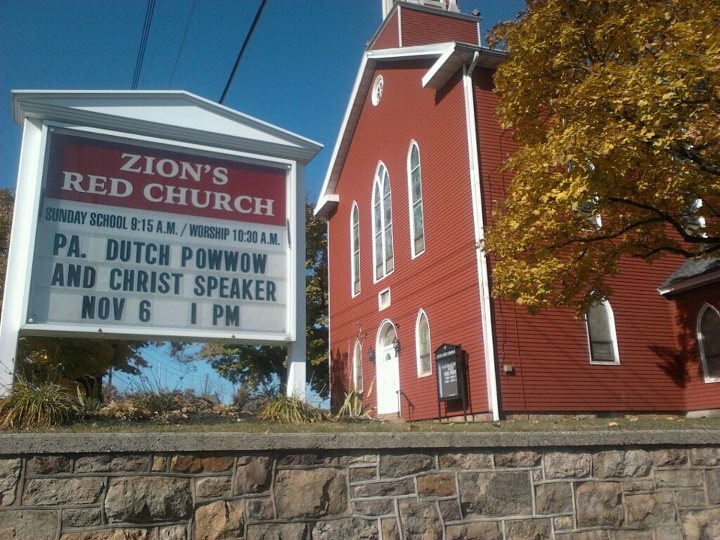 The PA Dutch live simple lives; strong in their faith in God and true to their cultural customs. In the past two or three hundred years, the Pennsylvania Dutch have migrated across the country and have made their homes in many states; such as Kentucky, Iowa, Ohio and Michigan. You can also find PA Dutch in Maryland and West Virginia, as well as other states. But nothing compares to the 'real' PA Dutch, the communities that are still very much alive in Pennsylvania. 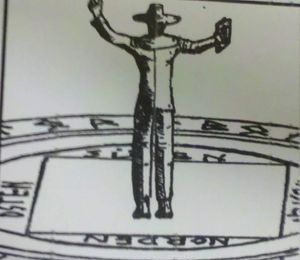 Hexerei, in the mind of the PA Dutch, is the practice of witchcraft. Witchcraft, in the eyes of the early settlers, was identified as malevolent magic used to cause harm. Contrary to popular belief, there were no "good wiccan witches" in America prior to the coming of Ray Buckland, and so witchcraft was thought of as "bad" and that was that. Those who would "try" for you (as they called it, "trying" meant to work for you) and use their skills for good were the Brauchers, or Powwow. Those who were not-so-good would be referred to as Hexerei. 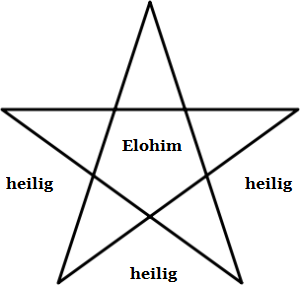 Hexerei differs in it's approach to healing magic because it is self-serving; meaning designed only to satisfy the ego of the witch/hex who is working the magic. 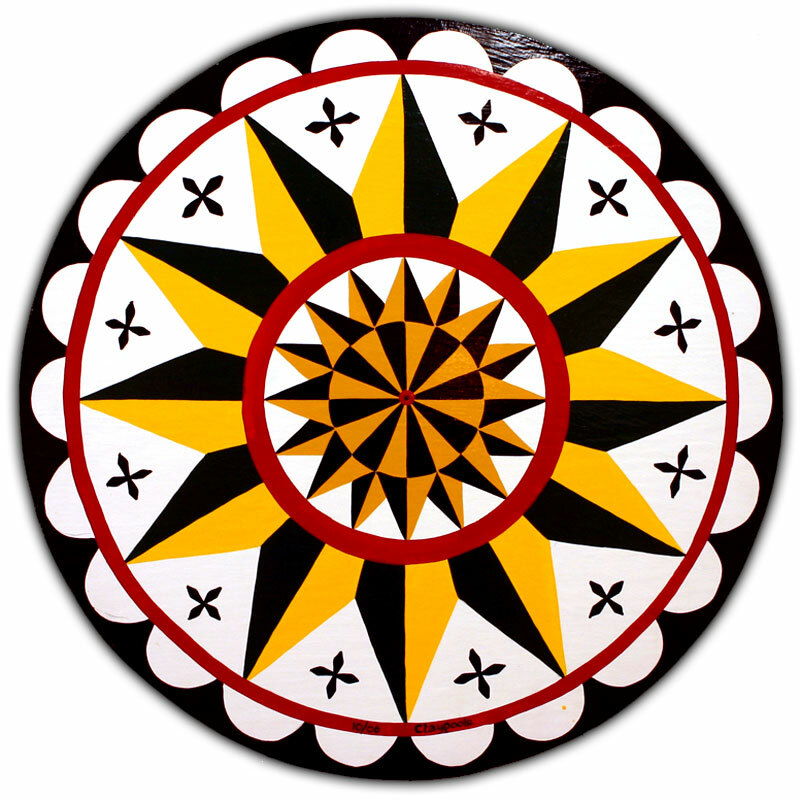 Where Powwow is a gift from God; used to heal and protect; Hexerei is a manifestation of the Ego and utilizes spirits and demons and other dark forces to attain the harmful and malevolent desires of the caster. My advice to you: don't go there. I've personally known several individuals who have crossed this line, and it's done them no blessing, trust me. Take elm wood on Good Friday. Cut the same into two inch pieces while calling the Holiest Names. Cut upon them, in the three holiest names, three crosses. Wherever such a slip is placed, all sorcery will be banished. 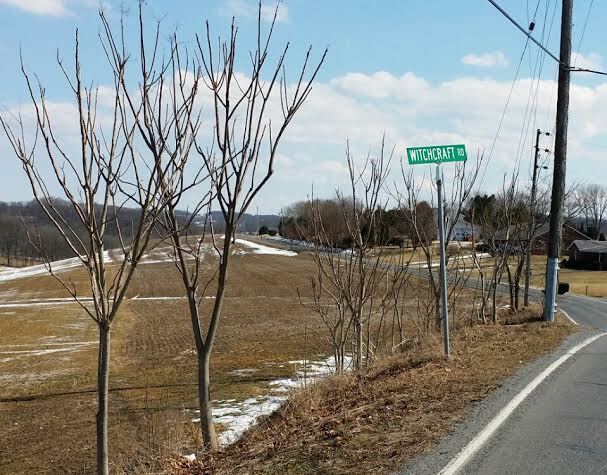 Witchraft Road in Berks County. "First, you must understand that the Dutch (PA Dutch) define a witch differently. There's none of this "good witch" and "bad witch" nonsense. A witch is a witch and is up to no good. Anyone with a moral agenda is a healer and a Braucher, not a witch." "Whenever a witch died, her mantle descended to her daughter, and likewise the wiles of the witch doctors (powwower) who were supposed to be capable of combating her influence were usually handed down from father to son." "Accordingly, the incantations of the witch-doctors (powwowers) make extensive use of religious symbols and prayers in which one easily recognizes the survivals of liturgical weapons employed by the mediaeval church in its warfare against witchcraft." NOTE: Where the mention is made of 'witchcraft'; this does not automatically include those who consider themselves to be 'witches' in the modern, primarily neo-pagan sense of the word; such as with the religion of Wicca. "Witchcraft"; as it applies to this website and the PA Dutch, is the practice of MALEVOLENT magic designed to cause discordance and harm. This website does not endorse or support this type of magic. Get your copy of Hex Hollow! 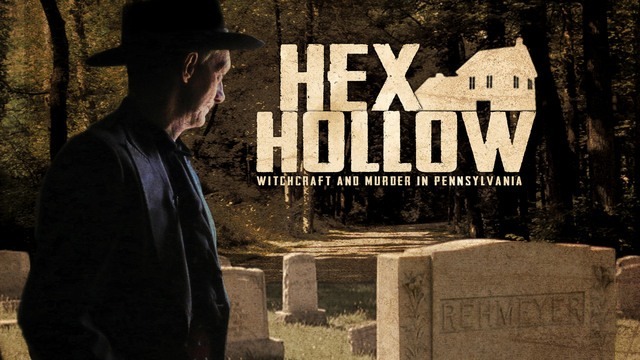 It's a fantastic documentary detailing the beliefs of witchcraft and powwow in early Pennsylvania history and the role that both played in a 1928 murder! CLICK HERE for ordering options! Powwow is an extremely important part of my life and I truly love the culture of the Pennsylvania Germans; a culture in which I was raised and am very much a part of today. Powwowing is more than a simple little magical system; it is truly a way of life. It's a devotion to the preservation of a culture, the power of faith, and the commitment to helping others. I have worked in many venues to teach Powwowing over the past few years; including public seminars, private group workshops, instructional videos, radio programs, online chat interviews, university lectures, discussion forums, this website, and my own published works. 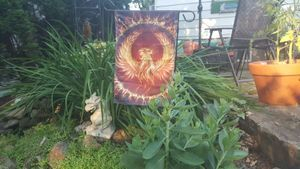 This website was created to share my experience of Pennsylvania Dutch Powwowing with you and teach the system as it is known within our culture. 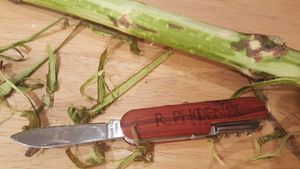 There are many great websites and resources to help you understand the many different aspects of PA Dutch culture; including it's history, customs, beliefs, and even recipes! For an extensive listing of links to many academic and historical sources about Pennsylvania German history, culture, religion, and powwow practice, please see the FREQUENT QUESTIONS link at the top of the screen. If you'd like to read more scholarly work about the Pennsylvania Dutch, then I highly recommend the website archives for the Kutztown University Library, which can be viewed HERE. If you are interested in reading about the progression of the Pennsylvania German language, which is a major identifying factor amongst the PA Dutch; it may even be said that it helped define the culture; I suggest reading THIS LINK. Here is the WIKIPEDIA PAGE describing the Pennsylvania Dutch, who they are, where they come from, and how the culture has maintained a strong presence in South Eastern and South Central Pennsylvania for over 300 years. Here is a fantastic article about the Amish and Mennonites. 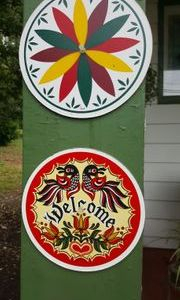 The PENNSYLVANIA GERMAN SOCIETY is dedicated to the preservation of the PA German culture, in all of it's aspects. 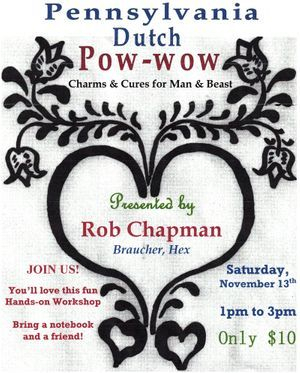 While my website deals specifically with PA Dutch Powwowing, that is just one small part of our culture. Check out their website for updates on all the great work they do! My grandparents were Pennsylvania German through and through (descended from Henne, Koenig and Hauser lines in Berks County and Austria), and I remember meals at my grandparent's home were always a good time, with lots to choose from. 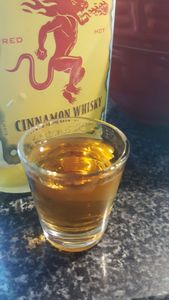 I found a nice blog with all of my favorite PA German recipes that remind me of home! GO HERE to check them out! There are many individuals working hard to preserve the culture and language and beliefs and customs of the Pennsylvania Dutch. For those interested in helping to preserve the culture, preserve the tradition of Powwowing, and learn the system of Powwowing for themselves, this website is for you. Me watching the workshop attendees practice a healing charm. Moonbeams in a Jar (Selinsgrove Pennsylvania), Powwowing seminar November 2010. This was my first experience teaching Powwowing in a public venue and I had traveled nearly three hours to do this seminar. When we arrived at the shop and began setting up my equipment, I realized I had left all of my seminar notes at home and just went with it and it ended up being a fantastic seminar. That's when I learned that if you are passionate about something, you don't need notes. I do my best teaching when I don't plan it out. 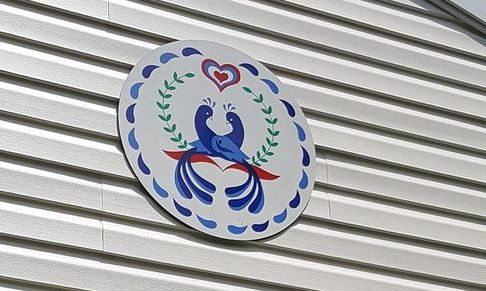 Hex signs are a common site on barns in PA Dutch country; particularly in Berks County, but also common in other Southeastern and Southcentral PA counties. The rosetta is a common symbol on hex signs. 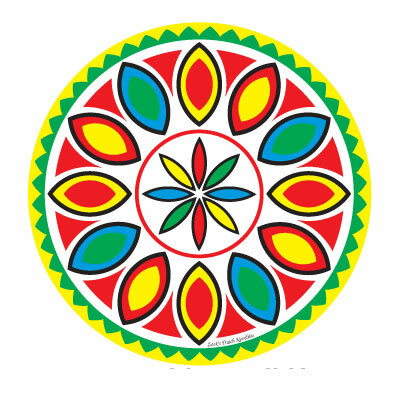 Most hex signs are made with primary colors. 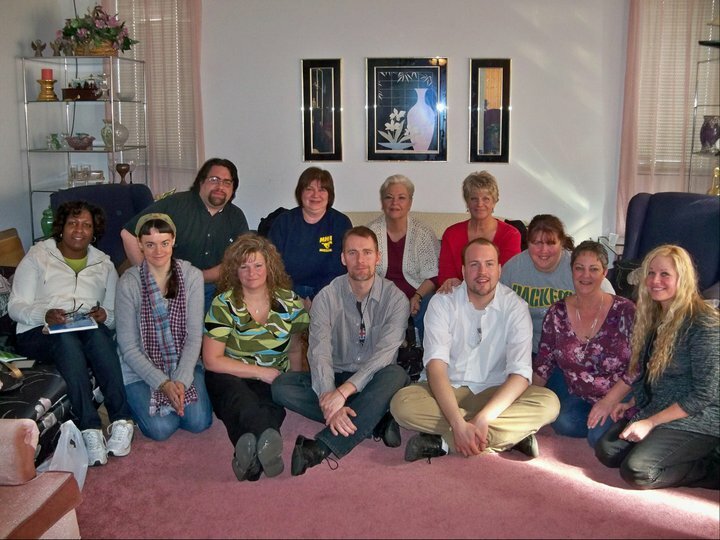 This is one of the groups I taught while in Charleston, West Virginia (January 2011). There were two back-to-back seminars that day. It was exhausting, but loads of fun. There were two really awesome groups of people and, I didn't know it until this event, but the folks in Charleston have a lot of knowledge about Appalachia Granny Magic, which is not so common here in PA Dutch country. Although the practices are related in many ways, their magic has a unique energy that I had never experienced until that day. This was my first chapbook, published in 2010. The lesson I learned from making this was that there is a need and a want for proper Powwow information. Because of the success of that booklet, this website saw a lot of traffic so I began devoting all of my free time to building the information here. This booklet is no longer available, which is probably a good thing because looking back on it I am not happy with the work I did then. However, it was a springboard for further research and work, and I'm grateful for the experience! In April 2012 I was invited by Indiana University of Pennsylvania to speak at a religious studies class then the next day asked to do a seminar for the University about PA Dutch Powwow. This was definitely one of the coolest experiences I ever had; traveling to Indiana PA, meeting some really cool kids and professors, and having a chance to share what I love with the school. This picture is me (on the right) and the computer tech guy (on the left) setting up my projector. It was a great time! In Spring 2012 Bill and I met up with my good friend, Chris Bilardi (left), and a mutual friend, Patrick Donmoyer (center). Chris is the author of the Red Church, the best work on PA Dutch Braucherei that I've ever seen. Patrick works with the Kutztown University Historical Society in Berks County PA and studies all aspects of Pennsylvania Dutch culture. This picture was taken at Stony Creek Inn, an authentic Austrian restaurant in Berks County. One of the most memorable points of this day was the group of older Austrian people sitting at a nearby table singing traditional Austrian songs. As is traditional in Pennsylvania Dutch culture, PowWow is an aspect of religion, and that religion is often Lutheran or Anabaptist. In some instances, Catholics practice PowWow (Hohman was a Catholic). In my church, PowWow is a part of our congregation's history and many within the congregation have either had personal experience with a PowWow in their community or have had a PowWow in the family. This is the truest and most sincere manifestation of Powwow; a part of the people, the culture, and the church. Bill and I live about 30 minutes away from the Nelson Rehmeyer homestead. 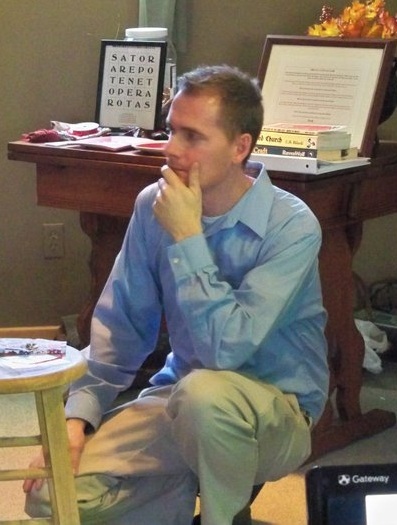 This is me at the Rehmeyer house in 2011, reading the plaque posted on the porch. 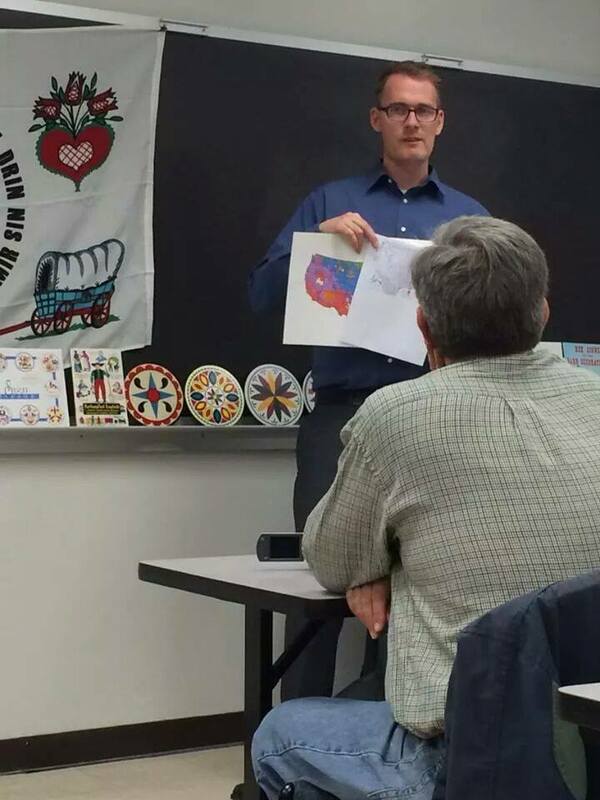 In 2014 I taught a class at Baltimore College about Powwowing and the Pennsylvania Germans. What I learned from this experience is that very little is known or understood of our culture once you leave the borders of Pennsylvania. Some of the students had never seen or heard of hex signs until that day! It was an enjoyable experience, and I would gladly go back and do it again. In my area I'm known as the Powwow Guy. Now I will walk over the threshold. I meet three men, not yet very old. The first is God the Father; the other is God the Son; the third is God the Holy Spirit. They protect my body and soul, blood and flesh, that in no well I fall, that water may not swell me at all, that a rabid dog may never bite me, that shot and stone may never smite me, that spear and knife may never cut me; that never a thief may steal the least from me. Then it shall become like our dear Saviour's sweat. Whoever is stronger and mightier than these three men, he may come hither, assail me if he can, or forever keep his peace with me. 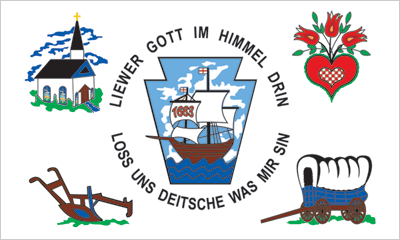 The flag of the Pennsylvania Germans (sometime called 'the Pennsylvania Dutch', incorrectly, of course). "Die Pennsylfaanisch Deitsch Faahne" created by "Die Grossdaadi Grundsow Lodge" (The Grandfather Groundhog Lodge) and co-sponsored by other affiliated Pennsylvania German organizations. Dedicated Oct.6, 1989 in Lehigh County Courthouse, Allentown, Pennsylvania. "COLORS: It is not just a coincidence that the Pennsylvania German flag uses the red, white and blue colors. It signifies that in spite of the ethnic backgrounds, we are first of all and foremost loyal and devoted Americans. SAILING SHIP 'CONCORD' - commemorates the journey from Krefeld to Germantown in 1683, the start of a great migration of German speaking people in search of greater religious freedom and better social and economic conditions in a new area of the world. KEYSTONE - the symbol of Pennsylvania, the principal and permanent settlement for the majority of early German migrants. CHURCH - indicative of the devoutness of the Pennsylvania Germans whose religious convictions were a strong motivating force in their daily lives. PLOW - symbolizes probably the most predominant of Pennsylvania German professions, the farmer. The plow further symbolizes the Pennsylvania German farm as a source of food for state and nation. 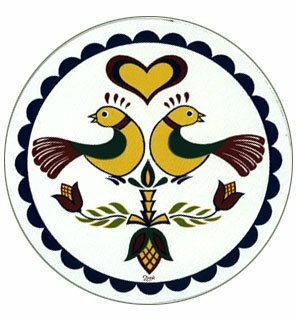 HEART & TULIP - represents the great skills and contributions of the Pennsylvania Germans in the field of arts and crafts. CONESTOGA WAGON - symbolizes the Pennsylvania German's contribution to the need for transportation. The"Ship of Inland Commerce", as it became known, played a very important role in the Revolutionary War under the guidance of Pennsylvania German teamsters. It also played a tremendous role in the westward expansion of our nation. DIALECT EXPRESSION - "Liewer Gott Im Himmel Drin Loss Uns Deitsche Was Mir Sin" "Dear God in Heaven, Leave Us Germans What We Are", implying "Let us keep our traditional ways". This dialect expression symbolizes the main instrument of communication used by the Pennsylvania Germans in their everyday social and economic associations." "The Christian church was at the heart of the Pennsylvania German community." I love the Pennsylvania German flag and I hope that all of my efforts over the years to preserve the practice of Powwow in it's most traditional form helps to "keep our traditional ways". It was so important to the PA Dutch that they not lose their cultural identity. With the passing of my grandparents, very little remains in our family of their influence, so this site and all of my work is dedicated to them and all the family (known and unknown) in the Bankes, Henne, Koenig, and Hauser lines in my family from Berks County, Schuylkill County, and Austria. 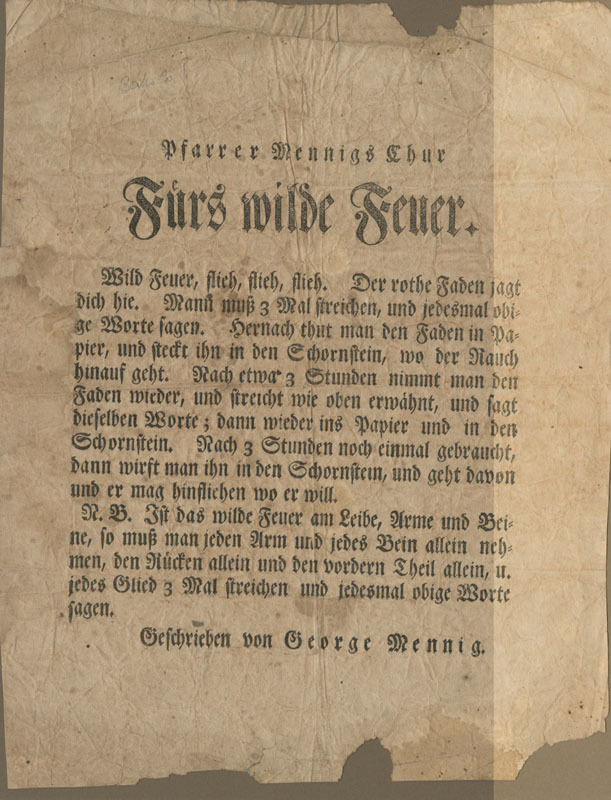 The Pennsylvania Germans were of numerous religious persuasions; including Lutheran, Anabaptist (Mennonite and Amish), Quakers, Brethren, and Moravians. These were the main religious influences. Sometimes people mistake me for Rosicrucian or Theosophist (might by my mystical side) or even Amish (?!). But the truth is that I'm a member of the Reformed (UCC) and ELCA church. Here is a nice article explaining the differences between these religious groups and how you can tell them apart. If you'd like to read about the immigration of the people who would become known as the Pennsylvania Dutch, I recommend READING THIS. It is a record of the waves of immigration and early settlements in Pennsylvania. For more history on the Pennsylvania Germans, I recommend this free book download, The Pennsylvania-German: devoted to the history, biography, genealogy, poetry, folk-lore, and general interests of the Pennsylvania Germans and their descendents. Finally, no study of PA Dutch culture or PA Dutch Powwow would be complete without reading FOLK-LORE OF THE PENNSYLVANIA GERMANS published in 1888. I've gotten several requests to translate German into English for various purposes. I love these emails but unfortunately I am no expert in German or PA Dutch dialect, so I recommend THIS LINK for easy translations. Keep in mind that there are variations in dialect and this translator is not a perfect system, but it will help. If you are interested in learning to speak the Pennsylvania German language, then go to THIS LINK for a series of lessons! It's free! Here is a fairly extensive website called Pennsylvania Dutch LIfe. There are links to all sorts of pages of interest for those who want to learn more about the Pennsylvania Dutch culture. This healing tract is from a Lutheran Pastor, George Mennig (1773-1833), who was also a PowWow doctor. The tract, written in German, is from Schuylkill County PA. It is a cure for 'wildfire' and reads "wildfire fly, fly, fly...the red string chase you away." Whatever objections may be raised against this book by disbelief and jealousy, these pages will, despite all such ob­jections, contain naught else but truth divine, since Christ himself hath commanded that all ye may perform, ye shall do in the name of God, the Son, and the Holy Spirit, so that the Devil may not possess any power over anything whatso­ever to do his will; and it will thus happen unto many per­sons, as was experienced by Job, who, having lost his fortune and his children, by his endurance and perseverance in the belief of God, and the blessings of the good deeds which were performed by him every day, Job wrested the power from the Devil, and he afterward became wealthier than he ever was before. Thus we also must act, that is, bless our pos­sessions, our homes, and entrust them to the care of the Lord, and doubtless the Devil will have to retire and succumb.